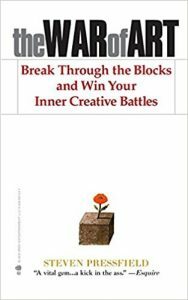 The War of Art by Steven Pressfield is a great book which is a mix of motivation, life-changing wisdom and a guide on how to become an artist. The War Art refers to the internal struggle we all have to battle to achieve our true potential. What’s the resistance in The War of Art? Have you ever struggled to start what you wanted to start? Maybe a business, maybe a creative endevor, maybe expressing a difficult opinion? When Does the Resistance Kick In? The resistance hates anything new an risky. Which means the resistance kicks in every time we do something outside of the ordinary. How Does the Resistance Stop You? We have been seeing a few different takes when it comes to passion. Cal Newport in So Good They Can’t Ignore You says you develop your passion. Robert Greene in Mastery and Angela Duckworth in Grit say instead that you first start with something you’re interested in, and then develop your passion over time. Steven Pressfield in The War of Art espouses the idea instead that you already have a passion within you. It’s that thing that you really doing, or that thing you wish you had done. Pressfield says that the fear coming from the resistance is also an indicator that something is your dream. If you are afraid of failing at it, it’s because you care about it. And if you care about it, you should run towards it. He says we live two separate lives: the life we’re actually living and the unlived life of our unrealized dreams. It’s the resistance that is stopping you from embracing the unlived life or your dreams. And if you let the resistance win, you will never live a fulfilling life. The best way to fight the resistance is to treat your dream like a professional. Treating your dream like a professional means that you don’t work on it a few hours here there, in hiss and fits. It means that you make it your main goal in life to pursue your dream. You immerse yourself in it, you live it in and breath it. Even if you have a main 9 to 5 job you can still treat you dream like a professional if you do everything in your power to move ahead towards your dream. The best of the best keep learning and growing even when they’re already at the top, like Tiger Woods and Madonna. Steven Pressfield recommends you don’t focus on the goal and reaching it as quickly as possible. That might lead you to set unrealistic goals and get discouraged along the way. Instead, focus on the process. Pace yourself, ration your work and execute it, day in and day out. Instead of seeing obstacles like impediment towards your goals, learn to see them as opportunities to get closer to your goals. You will certainly face challenges, and each challenge you overcome is one step closer to your goals. Hierarchies are everywhere, and most people allow the hierarchies to define them and dictate their lives (also read The Small Pond Syndrome, or why social status in hierarchies is futile). Hierarchies all oppose change and try to “pressure you” into a determined role. Professional artists thus must battle externally imposed hierarchies to stay true to their art and craft. I’ve been reading a lot on copywriting recently. I loved most of those books (Web Copy That Sells first and foremost), but one thing they all had in common which I didn’t like, was that they all recommend you write for your readers. I like the opposite approach instead. Write what you like and your readers will auto-select themselves. Which is the same approach Steven Pressfield takes in The War of Art. He says that instead of focusing on trying to guess what people want, professional artists focus on their art. Like Steve Jobs or Elon Musk. Or the writer Rainer Maria Rilke, who recommended you write for yourself and your art will be much better. Pick a Territory in Pressfield’s work is not just a physical territory -like, he says, the gym for Schwazznegger-, but a field where you can keep growing. It can be computing or film-making like Woody Allen. This concept is similar to The One Thing, which basically recommends you focus on one thing in your life. Whenever you want to do something you are passionate about, it’s only natural you will be afraid. The amateur thinks he will conquer fear and the do it. The professional knows he has to sit with the fear. Understand that the fear only confirms to you that you should do it. Keep chasing your dream with full dedication and unending perseverance. Those who are the meanest in their criticism are the ones who haven’t expressed themselves yet. This is a concept very similar to Marcus Aurelius’ Meditations. And it’s the same when we criticize others too vehemently. Look at yourself first. Are you not expressing yourself enough? Are you not going after what really matters and what you really love? I don’t really like this name. It’s confusing with The Art of War by Sun Tzu. And I also don’t like this idea of “war against the resistance”. Guys, don’t make the monster bigger than it is. In the third part The War of Art goes a bit off the rails describing how artists are a manifestation of the divine. It’s an interesting point of view, but I don’t particularly appreciate . And it sounds elitists. Why are artists the conduit of the divine and not welders, sportsmen and employees? He goes into some further woo-woo “science” with the ego and the relation between illnesses and embracing our own real self. The more rationals among you will probably also not love that part. And you’d have a point, in my opinion. The War of Art nails it both when it comes to the resistance and how to beat it and ship your art. I won’t list all the pros here because they are too many. The War of Art goes a bit woo-woo in the last part but it’s overall an awesome, awesome book. It’s one of those rare books that can combine inspirational content with potentially life changing information. It is somewhat very similar to Seth Godin’s Linchipn, and then I realize that Seth Godin wrote his book later. Anyway, I can definitely recommend if you’re trying to achieve something with your life.